Our Emergency Survival Drinking Water is purified and comes with a 5 year shelf life. No need to filter or use chemicals to treat. It's ready to use. Drinking Water Supply for up to 10 people. At the recommended minimum water consumption of 2 pouches per day, this carton provides 30 daily rations which is equal to a 3-day supply for 10 people plus an extra 4 pouches. 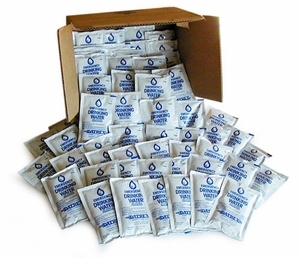 The DATREX drinking water we offer has been purified and is packed in specially sealed non-transparent pouches to provide a true 5 year shelf life. It is US Coast Guard Approved. You get 64 water pouches in total. One carton is the US Coast Guard recommended minimum 72-hour (3-day) survival supply for up to 10 people. For questions regarding the current batch date, please contact us. The leadtime shown above is an average leadtime for this product and actual leadtimes might vary depending on order volume or demand from the public. Leadtimes can vary from a few days if inventory is readily available to 2 to 4 weeks during high demand seasons or after disaster events. To get the current accurate leadtime, please contact us.